"You only need one man to love you. But him to love you free like a wildfire, crazy like the moon, always like tomorrow, sudden like an inhale and over coming like the tides. Only one man and all of this." 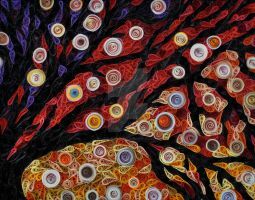 -C. Joybell C.
This work was created by first hand rolling many, many little strips of paper into swirls, shaping them and then placing them together in a mosaic fashion. This piece measures 8x10" and took approximately 40 hours to create from start to finish. Gorgeous! Congratulations on your DD. This technique is amazing, and I love how you combine the colors! Great work!! It looks like very laborious work, I'm impressed! Congrats with DD! Wow! Thank you all SO much for the great comments. I am very thankful for al your kind words. THIS. IS. SO. INCREDIBLY AMAZINGGGGGGG!!!!!! i am in love with this. so very much. Reminds me of work by Gustav Klimt in some respects due to the iridescence. You have a lot of patience, nice job. Aw, I have always loved Klimt. The influence must be in me somewhere. Thanks for the comment. Yes, but fun work Thank you! Beautiful work!!! Very creative piece! Stunning work, it's got a great rhythm to it! fantastic! and all with paper. i'm really really impressed! well deserved DD!